Articles on the Anthology’s grand opening ran in both the New York Times and New York magazine in late November. Plus, the Anthology itself ran a full page ad in the Times with the screening calendar of its first four days. Through that printed material, those early days can be pretty well reconstructed. Canby also offered a detailed physical description of the Anthology that was then located at 425 Lafayette Street — Danish-modern decorated offices, a library of film, cutting rooms and, most importantly, a unique 90-seat theater designed by filmmaker Peter Kubelka. Kubelka’s screening space was dubbed “the Invisible Cinema.” Everything in the room, from the walls to the floors to the ceiling to the seats, were painted black. Those seats were outfitted with blinders on either side so that audience members could only see the screen and not each other. In his article, Canby notes that while New York City’s art and independent film community was struggling financially, the Anthology was opening with great flourish and, apparently, no worry for money. The Anthology itself implies that it was fully funded by philanthropist Jerome Hill. However, Canby notes that the non-profit organization behind the theater also included other sponsors from NYC’s art and literature elite, such as Norman Mailer, Mr. and Mrs. George Plimpton, Robert Rauschenberg, and Mr. and Mrs. Willard Van Dyke. Plus, the Anthology was sharing space with Joseph Papp’s New York Shakespeare Festival, which is also described as a theater sponsor. Alongside Canby’s article, the Anthology ran a text-only advertisement in the Times that laid out its core mission. The ad reads, in part: “The unique concept of Anthology Film Archives is to present a cycle of selected films defining the history of cinema as art.” It goes on to describe that the theater would show three different programs every night and that the entire Repertory collection would be screened every six weeks, at which time it would then repeat. Each screening would cost one dollar; thus three dollars for the entire night. Half the theater — 45 seats — were held for advance reservations; while the rest of the tickets would go on sale one hour in advance of each screening. After each program began, nobody would be admitted further to the theater. 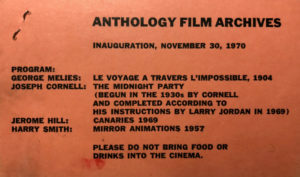 The full program for the first four nights that the Anthology was open to the public is below and it includes a mix of classic European cinema; by the likes of Georges Melies, Carl Theodor Dreyer, Jean Vigo; and modern experimental cinema; by filmmakers such as Bruce Baillie, Jordan Belson, Kenneth Anger and Stan Brakhage. After the first couple screenings, the Times ran another article on the Anthology, this time a review on the screening experience by Howard Thompson, who interviewed several theater attendees. Two of them were film students, Myrna Levi of NYU and Vincent Joliet of the School of Visual Arts, who both loved the experience of seeing films there. A couple out on a date, Roger Mignon and Joan Rappaport, had mixed opinions. While Mignon seemed to enjoy the experience, Rappaport was disappointed in the theater’s lack of intimacy. Not a good date destination, apparently.